Put Wind in Your Tank—Vroom! 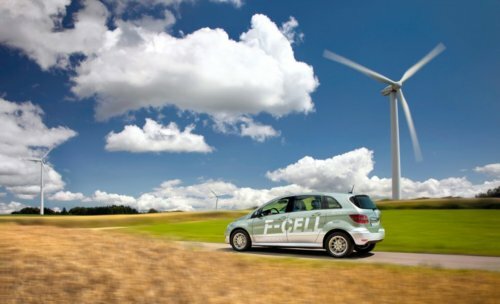 Now this is an intriguing new technology from Germany’s ENERTRAG, via the WindSector blog — the hybrid power plant makes hydrogen from wind power to fuel automobiles! The techies among you will want to click through to see the technical drawings on how it works, but I’m hoping the economic development folks will get busy trying to figure out how we can get one going in Vermont, or at least somewhere in New England…. This is great news because now renewable energy will seem ‘real’ to the public. I’ve been in the workforce long enough to remember IBM’s entry into the personal computer market, which suddenly bestowed credibility on the product category previously occupied by others without household brand names. Here’s hoping the same phenomena happens with clean renewable energy — quickly.